Ask Ann - Wylie Communications, Inc.
Want to jump-start your writing skills, recharge your batteries and get your creative juices flowing with some 1:1 coaching? Call me! 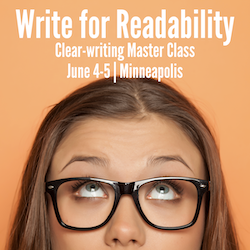 Polish your skills with your personal writing coach, find new ways to reach your readers or get your questions answered in a 2-hour session with Ann. Need a fresh set of eyes on a key message? Have a writing problem you’d like help solving or a question you need answered? If so, Ask Ann is for you. With Ask Ann, you get up to 2 hours of my time via phone, Skype or email to solve your writing challenges, answer your burning questions or polish your writing skills. Most folks use one of those hours to have me review, mark up and return a message before the session. But you decide how to best use our time together. Get feedback on a release or article? Brainstorm ideas for a special communication? Look at your e-zine to see where you might be losing readers? Identify opportunities to make over a webpage for mobile readers? Review a social media stream and suggest areas for improvement? Get ideas for moving your business to the next level from a successful communications firm owner? Please email Ann your availability, and we’ll see if we can work something out. Cancellation clause: With more than 24 hours’ notice, you may reschedule without penalty. Sorry, no refunds for no-shows or late cancellations.